With a capacity of 120 passengers, this vessel is 100% electric and does not need the auxiliary use of fossil fuels, thereby eliminating CO2 emissions. The CEO of the Spanish innovatice shipyard Metaltec Naval, Enrique Arriola, presented this morning at its industrial facilities in Raos (Cantabria) the first unit of ECOCAT, Europe’s first electrosolar passenger catamaran. The vessel -with almost 20 meters in length, 8 in beam and some 26 tons- has a 100% electric propulsion system, without auxiliary engines, with an 8-hour navigation autonomy. ECOCAT carries two engines of 50 kW and 8 batteries of 30.5 kW each, four per hull of the catamaran. As Arriola detailed, the photovoltaic solar energy generation needs of the ship made it essential to install 120 solar panels, which has required the development of a deployable and retractable pneumatic solar wings system that increases the area of energy collection. 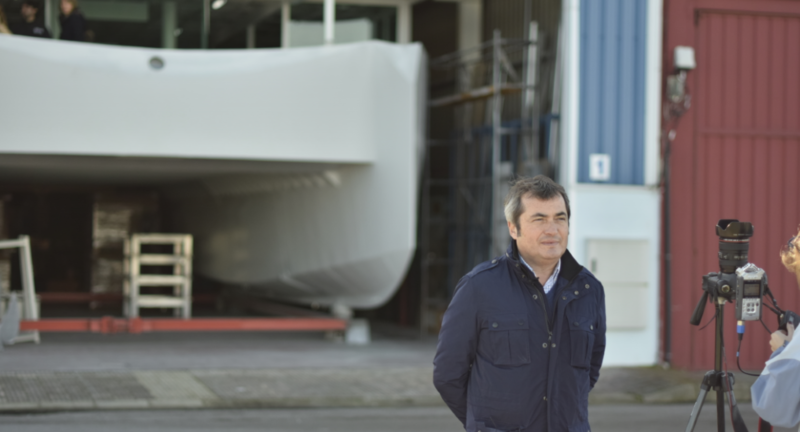 The CEO of Metaltec Naval, Enrique Arriola, in front of the vessel after the presentation to the media of the last phase of the construction process of the first ECOCAT unit. 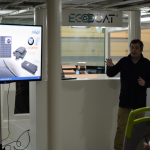 The energy storage system of ECOCAT integrates BMW batteries marinized by Torqeedo, international leader in marine electric propulsion systems. 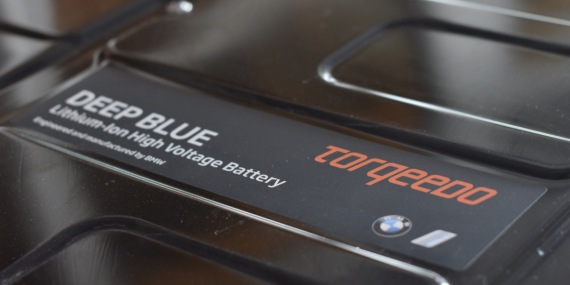 The CEO of Metaltec Naval has highlighted the work with leading companies at an international level, with the installation of panels of the US multinational SUNPOWER or the marinization of BMW batteries by Torqueedo.  Precisely, Torqueedo, the leading German company in marine electric motorization, has developed, together with the engineering team of Metaltec Naval, an innovative software model for the management of the solar energy capture-storage process. ECOCAT, with a capacity of 120 passengers, has had a development cost of 1.8 million euros -of purely private investment, as Enrique Arriola has emphasized- and has a unit value of approximately 1.5; figures that the CEO of Metaltec Naval expects to adjust after the last technical tests, scheduled for next March-April and the subsequent activity period of 1 to 2 months in the Bay of Santander. 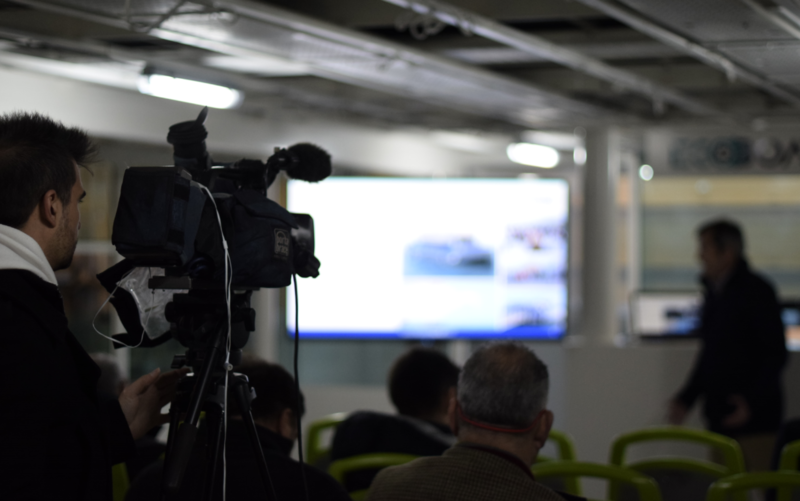 The technical meeting with the media was carried out on the deck of the ship, in dry dock in the company’s industrial facilities, specifically in the area destined for the passage. After passing the referred operational tests, the vessel will move to the Spanish Mediterranean, one of its target market areas, where it will show its capabilities in various points of the Valencian coast, Balearic Islands, etc. 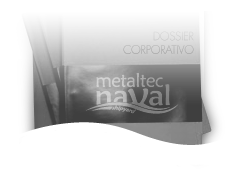 Arriola has also accentuated the integral ecological commitment of the Metaltec Naval industrial project, not only in the propulsion formulas, but also in its constructive experience of more than a decade with aluminum; a material with a high recyclability level, compared to artificial fiber boats, for example.